Nigel Dawes is tied for fourth in the NHL among rookies in game-winning goals. So far, Dawes has three this season. Nigel Dawes has heard it nearly half his life. "You're too small," they used to tell him. "You'll never be big enough to play in the NHL," he would hear. "Forget about it," his critics bemoaned. "Try something else," they begged. "I've been battling it since I was 13- or 14-years-old," Dawes recently told NHL.com. "It's irrelevant to me now." A lesser man would have barked back at his critics by now, but Dawes, all 5-foot-9 of him, instead has taken the high road. He lets his play do the talking, and the 10 goals and 21 points he has amassed through 45 games this season with the New York Rangers carry much more weight than words ever could. "There are always going to be those people that question you, and I'll have to face that my whole career," Dawes said. "I have to play like I can and make believers out of people that aren't firm believers. I have to change people's minds." As diminutive as he may be – at least in height – Dawes has made believers out of the Rangers this season. He's carving himself quite a niche as a rookie left wing on a line with center Scott Gomez and right wing Brendan Shanahan. Dawes has fit right in with the two multi-million dollar veterans, who are gaining more respect for their young linemate with each passing game. "He's definitely a goal scorer, and he knows how to score," Shanahan told NHL.com. "A lot of guys when they get a scoring chance are just thinking of ways to get a shot on goal, but Nigel is actually thinking of ways to beat the goalie with his shot. He can think in those situations, whereas 90 percent of NHL players are just thinking of getting a shot off. "No, (size) doesn't really matter. He's been good." Dawes first displayed his goal scoring ability in the Western Hockey League by pumping in 159 goals in 245 games over four seasons with the Kootenay Ice. It wasn't enough to convince NHL scouts that he had a major upside. 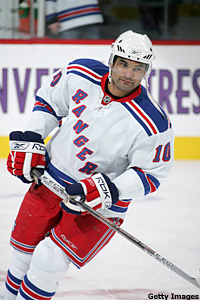 The Rangers were able to steal him in the fifth round of the 2003 Entry Draft, after 148 players already had been taken. Dawes, though, scored 35 goals in 77 games with Hartford of the American Hockey League in 2005-06. He rang up another 27 goals in 65 AHL games last season, and even managed 14 goals in 20 games with the Wolf Pack this season before sticking in the NHL. All this, and yes, he's only 69 inches tall (maybe 72 with his skates on). "I learned a while ago that (height) is not something I can control so I have just gone out and played hockey," Dawes said. "I've worked really hard to overcome that, and with how the game is played now, I don't think size is that big of a factor. I'm not going to back down from people or shy away from the physical areas. I have battled for a long time and I have to continue to do that to have success at this level." 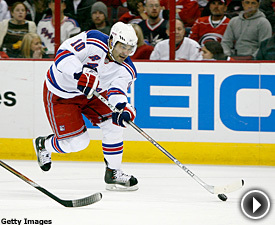 The Rangers aren't surprised Dawes has provided an offensive lift to a team that desperately needed it. "I want to be fair to him, but no, he's doing what I thought he would do," Rangers coach Tom Renney said. "I think Nigel would tell you he can do more, and we need him to push that envelope because there is some terrific offense in that kid." The goals, though, are only part of why Dawes has stuck in the NHL this season after scoring only one goal and playing to a minus-4 rating during an eight-game tryout last season. This season, Dawes is playing defense, too. He entered Sunday with a plus-9, with more takeaways (15) than he had turnovers (14). He also had 61 hits and 21 blocked shots. "The game is not all about scoring goals and putting up points," Dawes said. "You have to manage the game and stay away from turnovers. You have to play both ends of the ice, and that's something I've worked on consistently." That's music to Shanahan's ears. Shanahan is a future Hall of Famer who made his career out of being a two-way power forward. He has more than 600 goals on his résumé, but also has been a plus player in 17 of his 20 seasons, including this one. He's someone who demands his linemates play the other end of the red line, too. "What has been the difference in his time up this time is he has been more reliable defensively and playing away from the puck," Shanahan said. "That's the mistake a lot of players make when they're not in the NHL. They don't realize how good you have to be away from the puck even when you're a goal scorer. You can't be a player that gives up chances in order to get chances, and I think Nigel, since he has come back up, has been much more reliable in the defensive zone. "Unless you're putting in 70 goals a year you're not going to play in the NHL unless a coach can trust you defensively, as well." Dawes, though, will make his mark in the League with his goal scoring. And even though he's only 23 and has just 53 NHL games under his belt, Renney finds he's giving the kid a lot of leeway. "This kid has got a knack," Renney said. "There are times when he maybe could have made a pass and shot instead, but history suggests as a coach that I have to be OK with that because he can score." "Size is one thing," Renney said. "Who wouldn't want a (6-foot-9) Zdeno Chara on their team? That's pretty appealing, but 5-9ers can play in this League if they're strong." "Strength is more important than size," the coach continued. "There are big men in this game that are on their butts 50 percent of the time on contact, and there are others that are not. It's a matter of a good base and strong core, and that's what Nigel has."